One of today’s buzzwords – “responsible mining” – is like most others, so vague that it means whatever its user wants. For most corporate executives and many government officials, mining is responsible if it aims to maximize economic growth and economic profits, because mainstream economic theory tells us that that will make everyone better off in the most efficient way. In this view, the benefits multiply and trickle down to the poor. In terms of environmental impact, some proponents of this view argue that as a country grows in economic terms, certain environmental pollutants decrease. The governments of Guatemala and Honduras, which have increased the number of licenses granted to global mining corporations, seem to embrace this definition. Some corporations cast the definition of “responsible mining” within their concept of “corporate responsibility.” Typically, such companies do not change the production process itself, but rather commit to using some profits to do something “good.” In the Philippines, for instance, Australian-headquartered OceanaGold plants trees near its mine and contributes to medical missions and community programs. Yet another definition of “responsible mining” focuses on increasing the portion of the economic and financial benefits of mining that accrue to the Southern “host” country versus to the foreign mining entity. This typically centers on increasing the taxes levied on the mining companies. A more “progressive” version of this approach emphasizes how much of the funds stay on a local versus national level within the host country. The ideal – and probably least common – definition of “responsible mining” involves a comprehensive assessment of long-term economic, social, and environmental costs and benefits. This requires the free, prior, and informed consent of local communities before corporations influence communities or officials with social “contributions.” Environmentally, it involves careful assessment – based on full information by an objective party – of the impact of the mining, including all chemicals used in the mining process, all toxins released, and the broader environmental impacts and risks. The ideal definition may sound like pie in the sky, but it is not. Case in point: The government of El Salvador has not issued new mining licenses since 2008, primarily because a growing citizens’ movement has rallied around protecting the affected watershed, which supplies the majority of the country and is already severely polluted. So too did the Salvadoran government demand a Strategic Environmental Review, overseen by both the Ministry of the Environment and the Ministry of the Economy, to try to weigh the economic benefits (wages, taxes, etc.) 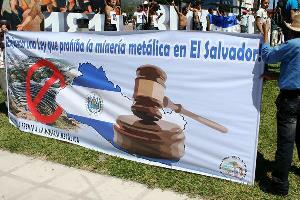 during a mine’s limited life against social and environmental impacts. Indeed, in El Salvador, as in the Philippines, grassroots communities and some key elected officials are trying to give deeper meaning to the definition of “responsible mining,” so that it is no longer merely a buzzword. Dr. Broad is a professor in American University’s School of International Service.